AS PART of the Victoria & Albert’s (V&A) India season, a striking piece of public art has been installed along Exhibition Road in Kensington, London. 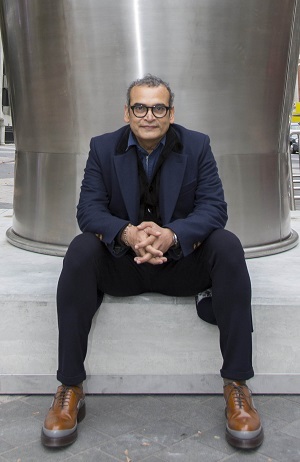 On Friday (October 23) “When Soak Becomes Spill” was unveiled at a special morning ceremony with its creator Subodh Gupta and V&A director Martin Roth both in attendance. The imposing steel bucket and utensils spilling out certainly make a statement. Gupta told www.asianculturevulture.com shortly after the unveiling that the installation was a reminder of his childhood and what it meant to be an artist now. “When Soak Becomes Spill” is evocative of many things, not least an abundance of ideas and an energy that is brimming and uncontainable. Roth told the press that he had really got to know the artist following a delayed flight in India. In an address from the V&A shortly after the unveiling, he said: “Our flight was delayed by six hours in Bihar and we talked about his life story and many family things and about this project. The pair were involved in judging an architectural competition in Patna some six years ago and made a connection there. Gupta said he had been working on the installation into the early hours of Friday morning and was taken aback by the official unveiling taking place a few hours later. “There was so much of a crowd on Exhibition Road in the morning and during the whole day so many others will have access to it,” he said proudly. “It’s given me another kind of excitement. Gupta is one of India’s best known artists and his work covers sculpture, installation, painting, photography, performance and video. His work often transforms the way we look at everyday objects, showing their both their utility and innate beauty but also drawing attention to ecological and social concerns. He grew up in and around the city of Patna in Bihar, one of India’s least developed states. His work has been displayed all over the world and he was the subject of a major retrospective at the National Gallery of Modern Art in Delhi in January 2014. He told www.asianculturevulture.com that he had no conception of what being an artist was when he grew up in Patna. That something else was creating – a keen drawer and painter and visually imaginative, he turned to any task where he could utilise his imagination and vision. It was the start of something that has now culminated in a public art work in the UK. The bucket was made a while back and was commissioned and industrially manufactured and the whole work is a higher grade of steel than for domestic use (these are often washed daily or routinely, with this it is built not to rust or decompose over six months). You can see “When Soak becomes Spill” until January 31 when it will transfer to Gupta’s next major exhibition. That will be at the gallery, Hauser & Wirth Somerset (in Bruton in the county), from February 12-May 2 2016. “When Soak becomes Spill” is part of the V&A’s India Season which marks 25 years of the museum’s Nehru Gallery. Already open is “The Fabric of India”, which runs until January 10 2016. Our story on that is HERE. Hey, good website you’ve here. Thank you! It is definitely an impressive webpage. psyfat,Very informative useful, infect very precise and to the point. I’m a student a Business Education and surfing things on Google and found your website and found it very informative. ryaembr,Definitely believe that which you said. Your favourite justification appeared to be on the net the simplest thing to remember of. cahcdopzsqv,Wonderful one thank you so much ! btevkgbw,Some really nice stuff on this website, I enjoy it. cvifjofpomi,Wonderful one thank you so much ! jwzknd,Thanks for sharing such an amazing blog. I am so happy found this informative blog. sfysfqffwyr,Definitely believe that which you said. Your favourite justification appeared to be on the net the simplest thing to remember of. jjlkyqub Yeezy 2019,Thanks for sharing this recipe with us!! almnifnrb Yeezy Boost,Thanks a lot for providing us with this recipe of Cranberry Brisket. I’ve been wanting to make this for a long time but I couldn’t find the right recipe. Thanks to your help here, I can now make this dish easily. fhjohaokxg,Definitely believe that which you said. Your favourite justification appeared to be on the net the simplest thing to remember of. jacycppjqy,Definitely believe that which you said. Your favourite justification appeared to be on the net the simplest thing to remember of. kcoxmsr,Quality blog, keep up the good work. You may check our website also! eerjffzzb,Wonderful one thank you so much ! ooyfzhpf,We have a team of experts who could get you the correct settings for Bellsouth net email login through which, you can easily configure your email account with MS Outlook. igcpyweyjdiNew Yeezy,Definitely believe that which you said. Your favourite justification appeared to be on the net the simplest thing to remember of.